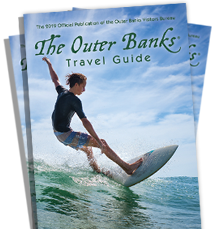 The Outer Banks is a sport fisherman’s paradise. The sheer quantity of angling opportunities makes our waters some of the best in the world. Offshore and inshore charter fishing, surf and pier fishing, brackish, fly and sound fishing, deep sea fishing - all with the season continuing throughout the year. The Outer Banks is "The Billfish Capital of the World," and for good reason. Hundreds of blue marlin, white marlin and sailfish are caught and released in our waters every year. The billfish season is long, with the peak for blue marlin in June and white marlin and sailfish most plentiful in August and September. All are caught consistently from late spring to early fall. Another big draw are yellowfin tuna, which are caught year-round.